After finally finding a copy at Wal Mart (several Best Buys were a no-go?! 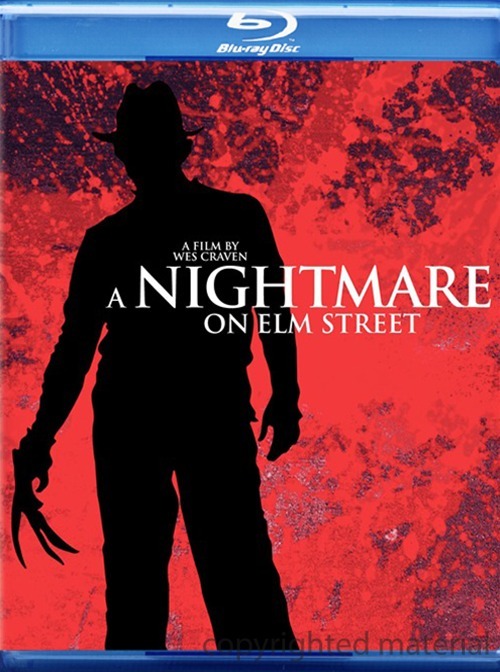 ), I just watched a good bit of the fresh A Nightmare on Elm Street Blu-ray from New Line. I must say that it's definitely the best Elm Street has looked since its theatrical debut. About a year ago, Alliance Atlantis of Canada released their own bareboned, rather expensive Blu-ray, but don't be fooled and settle for no less than New Line's excellent presentation. The 1080p/24fps picture quality is very impressive with plenty of inherent fine film grain and refined colors which might stick in the crawl of diehards as this transfer shares the new "less red" color cast of the Infinifilm DVD. Though if this is a quibble, you'll most likely completely forget upon seeing the gang pull up in the '58 cherry red Caddy. The film grain is especially important because this aspect reveals a level of high frequency detail absent in all previous home video incarnations--even the processed, waxy-looking Canadian Blu-ray. Grain is like fold marks on old posters or slightly yellowed pages in vintage comics--beautiful. What's even more impressive is the U.S. disc is from New Line Cinema. This particular studio is known for digitally eradicating grain from their Blu-rays; Lord of the Rings: The Fellowship of the Ring and Pan's Labyrinth being two of the most famous examples. So it's a tiny, niche miracle that Elm Street escaped the clutches of this entirely counterproductive practice for a transfer that's unlikely to be topped in the high definition realm. The audio comes in two English flavors, DTS-HD Master Audio 7.1 and the original mono track in Dolby Digital. The 24-bit (!!!) lossless 7.1 track is extremely aggressive, pronounced, and clear. Yet astute fans might notice a few missing "stunners" in the score also "unheard" in the Infinifilm DVD's standard DTS 5.1 mix. In contrast, even though it's probably preferred, the true center channel-only mono track is painfully muffled and much quieter. It's like listening to the VHS...only standing ten feet away with ear plugs. The special features mirror the Infinifilm with two commentaries, three documentaries (in 1080i HD), fact track, and three short alternate edits of the ending (in 1080i HD). If there is one thing I really hate to admit I don't like about Elm Street, it's the tacky shock ending, which simply feels extraneous and a bit dumb after the chilling image of Nancy's burnt mother sinking into the mattress. So I hate listening to the interview footage concerning Bob Shaye's involvement in tinkering with Craven's wishes involving the ending. Also it's plain odd hearing Craven stress how painful it was to see the film suffer MPAA cuts with this version still featuring the slightly edited version of Tina's death presented uncut in prior VHS and Laserdisc editions. The alternate endings are nice, but with some additional audio touch-ups one wonders why these weren't integrated back into the film with a seamless branching option. Some may not like the idea of the impending remake, but it probably was the catalyst for New Line to get off their asses so soon with this stunning Blu-ray of the classic A Nightmare on Elm Street. This might very well be the first must own genre Blu-ray of 2010. Am chomping at the bit for this one...guess I'll be picking it up soon. And yes, the ending of this film is dreadful. Yeah the ending was a little goofy. It'll be interesting to see what the remake's ending is like. The F13th remake ending was sooooo bad.